We have been working on the next big release of CartoDB for some months now. Affectionately given the title, 2.1, this release is really a major step forward for the platform. We have added in tons of new features, design and usability improvements, and most of all, multilayer support. 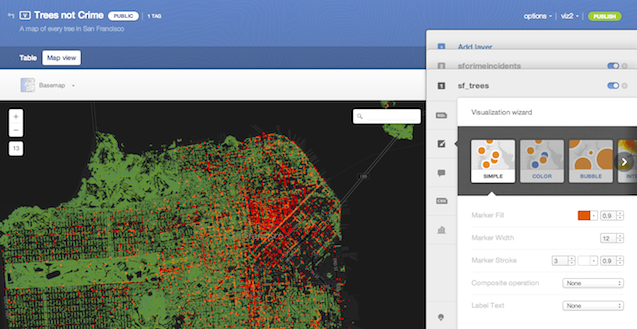 Multilayer support, in combination with new filters, new style wizards, and CartoDB’s built in SQL and CartoCSS capabilities will give you the ability to make some of the web’s most amazing maps. Take a look at the short video we created for you below. It gives a quick, beginning to end, overview of how you can upload data to CartoDB, mix and merge multiple datasets into a single visualization and then publish that visualization on the web. We think these improvements are going to open the door for tons of new mappers to dive right into making amazing visualizations on the web. We worked hard to keep the interfaces simple, intuitive, and beautiful so that you can focus on your data and your mapping challenges. We know that some of our users are already working on the next generation of maps, we’ve seen them, and we can’t wait to share them with you. Dive in today and get started on your own. As always, let us know what you think of changes to the platform and let us know about the visualizations you create. This has been a lot of work but we aren’t done yet, we are going to keep pushing forward so you can keep making innovative new maps.